Listing Your House In Long Beach, What Will It Cost? How Much Will Listing Your House Really Cost in Long Beach? There are many costs you should know about. These costs occur before you list your house for sale, during the listing process, once an offer has been made, after you’ve accepted an offer and finally, again, when you find yourself at escrow to close on the sale of your house. 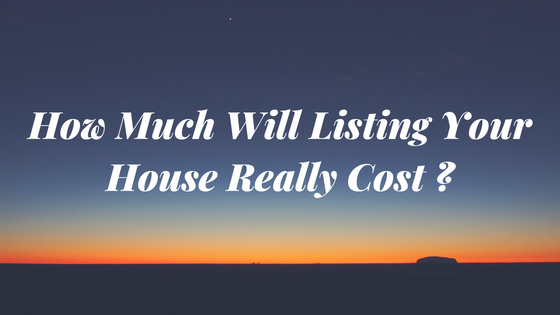 In this post, we take a look at some of the most common listing costs so that you can determine if a direct sale of your house (to someone like me) might actually be the better choice for your situation. First, the final price to sell a house in Long Beach can fluctuate greatly. It all comes down to the house itself, the current market conditions, the repairs that are needed, the location and more. Also, each real estate agent will work a bit differently. Some will charge you for things, while others state that they are “all-inclusive.” Before you sign a listing agreement, find out what listing your house in Long Beach will really cost you! Before you talk to an agent or get started with listing your house, you will need to take care of the following items. Some you can do yourself, while some others you might have to pay for, or actually, you really should pay a professional for them. You may or may not need all of the items below, but they are all important to review and understand. In order to create a home environment that is appealing, welcoming, yet neutral, you will want to make sure the house is clean. While you probably can do a good job yourself, it may be better to bring in a professional to do a thorough cleaning of the house from top to bottom. This can make the whole house look different. If you aren’t replacing the carpets or flooring, you will want to pay to have a professional cleaning service for those areas, as well. And don’t forget the exterior of the house, either. It matters! If you have a second story, it can certainly pay to hire a professional to come to wash your windows. While cleaning your house, also take the time to pack away all of your unnecessary items – the clutter. People do not want to see your personal possessions or clutter when touring your home. So you will want to make sure everything is packed away. In the short-term, you may need to consider an offsite storage space or pod to hold your items until you have moved into a new house. You can get pretty good deals, too, given many places will give you the first month free. A house with less stuff shows way better. You will want to fix anything that is visibly broken or worn. This includes fixing, patching and painting the walls, replacing cracked tiles and repainting the floorboards. You might also take this opportunity to make minor upgrades such as new fixtures or hardware. Sending money on these things can help improve the value of your home. You just need to be comfortable paying up for them upfront. You can’t have a beautiful listing when you have an ugly yard. The front yard is the first thing people see. This should not only be cleaned but also used as an opportunity to showcase your home. Many homeowners will add plants, flowers, new gates or fences to make their curb appeal really “pop”. While the property is listed on the MLS, you will still find yourself paying to have it for sale. There are many expenses you will be paying during this time that you could avoid with a fast sale directly to a professional buyer. While the house sits on the market you will still need to pay the monthly utilities. Even if you have moved out of the house, you still need to keep the water, electricity, and gas turned on for people coming to see the home. Not to mention, these utilities will need to be one during the potential buyer’s home inspection. You should also continue paying the homeowner’s insurance and property taxes up through the day of closing. You will also need to continue taking care of the cleaning and routine maintenance of your house. This is definitely not a time to neglect that. Remember, you want your house to show as well as possible. Even in this current market, many properties sit on the market. then add on having to go through escrow. It could be months until the house officially closes escrow. During this time, you could be out thousands of dollars that you could have otherwise saved. Some listing agents will include great marketing for your house, while others may not. To successfully list your house, you will want to ensure that the photos of your house are perfect. Some homeowners are now hiring drone photographers to capture their homes from above, especially if it’s an interesting neighborhood. When listing your house, the online presence is everything. That’s how you get people to come to see your house in-person. Once an offer has been made and accepted, you will still be responsible for the insurance, utilities, and taxes up until the day of closing. Depending on the buyer’s lender, this could add several weeks to your overall timeframe. In turn, this adds more money that you are paying out-of-pocket until escrow closes. Most offers are contingent upon an inspection and an appraisal. You can avoid the below costs with a direct offer from a company who purchases houses in as-is condition. Once the home inspection has been completed, your buyer has the right to ask for repairs or credits for repairs. It’s part of listing your house that you need to deal with. It’s based on the severity of the repairs and the buyer’s comfort with the repairs. It’s also based on how they want to use it as a negotiating tool to get a lower price or to get a credit. If there is a major problem with the house, the potential buyer will likely request it be fixed before going through with the sale. (The bank isn’t likely to fund a loan for a property with extensive damage either.) If your buyer decides to rescind their offer, you will need to disclose the needed repairs to all potential buyers moving forward. If you don’t, you are opening yourself up to a lot of liability. Ahh, termites. They are everywhere. In most California real estate transactions where lenders or banks are involved, you will have to pay for some level of termite inspection, repair (think wood rot) and fumigation (think tenting the whole house). This typically runs about $3,000 to $10,000 depending on the size of the house and the amount of wood repair and replacement. Termites love wood and most lenders require that all the wood be repaired before closing escrow. So, just know you will most likely be spending some money on termites when listing your house. Once you are signing the final escrow documentation, it is also time to approve the real estate agent commissions. This will typically run approximately 6% of the final sale price of your house. When you are considering whether to sell your house directly to a buyer like us or to list it, you can see why saving $30,000 (or 6% of a $500,000 sales price) can look very attractive. Many additional fees are bundled together as “closing costs”. These include document filing, title fees, credit check costs, transfer taxes, property taxes and more. On average, this will cost you another 2% of your final sale price. So, again, $10,000 (or 2% of a $500,000 sales price) plus the $30,000 from the real estate commissions is a lot of money! I’d prefer to keep the $40,000 myself. Wouldn’t you? Once you add up all of these costs, you can see that listing may not be the right choice for all homeowners. Many people find greater benefits by choosing a direct sale! Run the numbers for yourself, and then make the decision that works best for you!